Raja Lal Singhji usually resided in Jharkon in Ahirwara in Pargana Balabhent where he happened to discover a 'saptdhat' image of Ram (Raghoji) on the top of a hill. He established this image in the fort palace of Raghogarh which he has founded in V. 1734-1677 A.D. (Magh Sudi 5) on an elevation in the village of Kotda. As Gugor was always in imminent danger of being invaded by the Hadas from Baran, the Kheechi rulers had been on the lookout for a more suitable and central place to make it their third capital after they had ruled from Gugor for a period of 400 years. With the transfer of the capital to Raghogarh, Gugor was added to the Thikana of Chhabra which came to be called Chhabra Gugor, as it is known at present. Lal Singhji was a brave warrior and built mansions and temples, dug tanks and baories and laid garden. He gave land to temples. 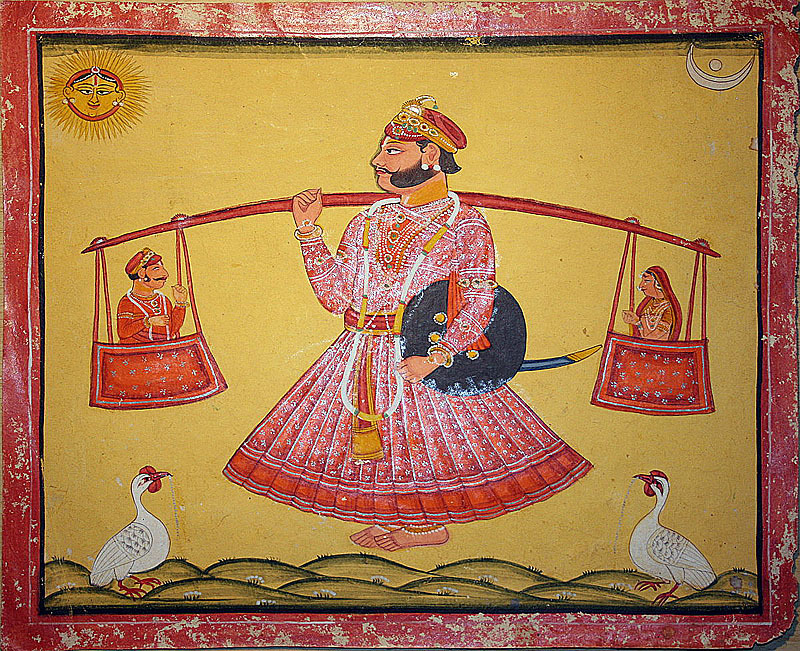 Lal Singhji was the son of Raja Garibdas. Amongst his three brothers one got the thikana of Bhamawad, he is ancestor of the Rajas of Garha-Jamner, the second one got Maksudangarh, a branch of Raghogarh and Ajab Singh got Guna. He had great relations with Jai Singh Kachhawaha of Amber (Jaipur) and Maharana Sangram Singh II of the house of Sisodias. He built temples, tanks, baolies and repaired the fortress of Aron Jharkon and Chanchoda. 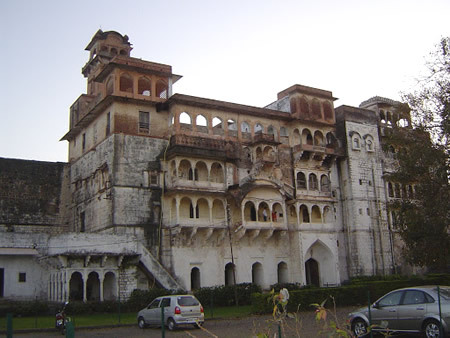 He has constructed the greater portion of Raghogarh fort palace. He was the lover of learning and patronized music and painting. He got a copy of Prithviraj Raso transcribed as early as 1708 A.D. and a set of his own portraits in different aspects preserved in the archives of Raghogarh, besides paintings on subject of Rag-Ragini, Bara masa and frescoes of Ramayana and Mahabharata on the walls of Charbhujaji Temple in Dhirpur village. These rare specimens of the Raghogarh School of Malwa Paintings still await the attention of connoisseurs of art. Dheeraj Singhji was charitable and generous towards Bhats, Bairagis, Brahmanas and Charans etc. He died in war. His memorial at Bajrangarh fortress is worshipped till today as that of a Sidh. Raja Gaj Singh (1726-29), 3rd Raja of Raghogarh - The eldest son of Dheeraj Singhji. 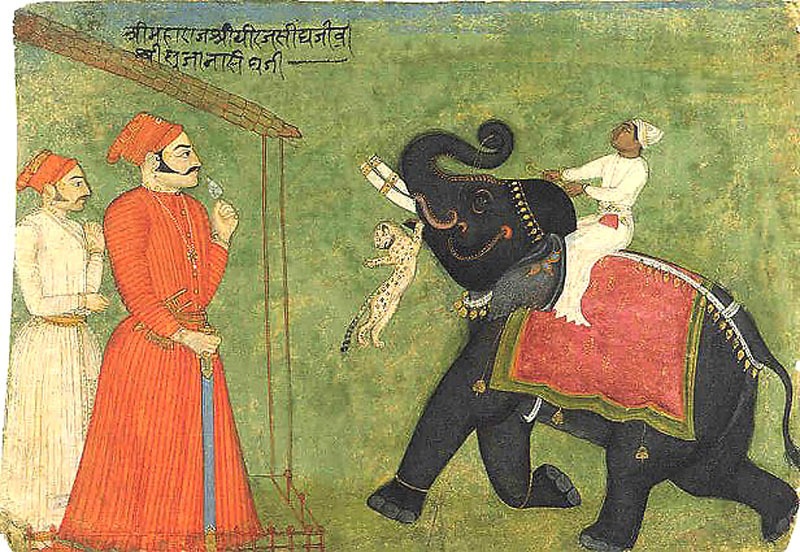 Raja Vikramaditya I ( 1730-44), 4th Raja of Raghogarh - he annexed Chhabra Gugor. His brave son Balbhadra Singh I put down the Rajput combination of Jagat Singh (Udaipur), Durjansal (Kota), Umaid Singh (Bundi) and Jagat Singh Rawat (Rajgarh) single handedly. His mother Rani Anup kunwar Gaudji was equally brave and fought against the Nawab of Bhopal. Raja Budh Singh, he was granted a tract of land by his brother in 1776, which later became the state of Maksudangarh, married and had issue. He died in 1795. Raja Balwant Singh (1770-97)- 6th Raja of Raghogarh married and had issue Raja Jai Singh. Hindupat Raja Jai Singh (1797-1818) - 7th Raja of Raghogarh He was 17 years old at the time of his installation in 1797. The exploits of Jai Singh have inspired heroic poetry. He was a far more famous warrior than his father Balbhadra Singh. In the words of James Tod -"The late celebrated Kheechi leader Jai Singh never took the field without the god before him. Victory of Bajrang was the signal for the charge so dreaded by the Marathas and often had the deity been sprinkled with his blood and that of the foe. He caused three images of the god to be chiseled and established in Bajrangarh, Raghogarh fort and town. Indeed this worship of Bajrang was terror to the Marathas". During his last illness like Maharana Pratap in the care of Kunwar Amar Singh, Hindupat gave his sword and lance to Dhonkal Singh Kheechi to continue his ancestral family warfare and told him he would join him soon on his recovery. But, alas! His recovery never came. He was proud to call himself "Hindupat" and rightly so not only because his ancestors had held this title for the last 400 years from the Maharana for whom he had fought with his contingent but also because a foreign power like that of the British addressed him and his descendents as "Hindupat". Raja Ajit Singh - (1818-56) - 8th Raja of Raghogarh He patronized pundits and poets and very versed in music and poetry. He supported Nana Saheb Peshwa, Tatiya Toppe and Shahdat Khan of Indore. Raja Jai Mandal Singh (1856-1900)9th Raja of Raghogarh Born 1821, succeeded 1856, married, Rajkumari Anand Kumari daughter of Raja Udai Singhji of Banera, and his wife, Rani Jhalji and had issue. He was quite hostile in the mutiny of 1857. On occasion of Dushehra 20 -22 goats were being sacrificed in Raghogarh, which was stopped by him. He had a versatile interest in Chemistry, Ayurveda, Astronomy, horse riding, spiritual pursuits, athletics and yoga. Raja Bahadur Singh (1902-45) - 11th Raja of Raghogarh , Born 8th March 1891, succeeded 14th December 1902; married, Baijilal Krishna Kumari [Rani Krishna Kumari], daughter of Raja Akshay Singh of Banera, and his third wife, Rani Shubhra Kumari. In 1911 invited to Delhi Darbar while he was a student in Daly College Indore. Raja Balbhadra Singh II (1945-67)- 12th Raja of Raghogarh, Born 1916, married Rani Aparna Kumari, died 1986, daughter of Maharaja Bahadur Chandra Mouleshwar Prasad Singh of Gidhaur. His succession was recognized in late 1948. He has received his education at Daly College Indore and was a good sports man like his father as well as a keen scholar. He obtained his post diploma from Mayo College, Ajmer and received the Viceroy's Gold Medal for all round efficiency. He was elected in 1952 as the member of Madhya Bharat Legislative Assembly from Raghogarh constituency. He besides being charitable rendered great service to the cause of Kheechi Dynasty by causing records to be collected from Malwa and Rajasthan. These records comprise of inscriptions, copper plates grants, folk songs, sanads etc. So little or nothing could be done in this direction except the publication of two booklets - 'Hindupat Vijay' and 'Kheechi Vanshawali'. Mandakini Kumari, born 13th February 1973, married 9th December 1993, Shri Paranjayaditya Krishnakumarsinhji, Raja of Sant. Mradima Kumari born 29th April 1976, married 16th March 1996 Shri Ranjitsinhji of Muli. Karnieka Kumari, born 27th April 1979, married 23rd November 2005, Shri Siddharthsinhji Chaitanyadevsinhji Jhala of Wadhwan. 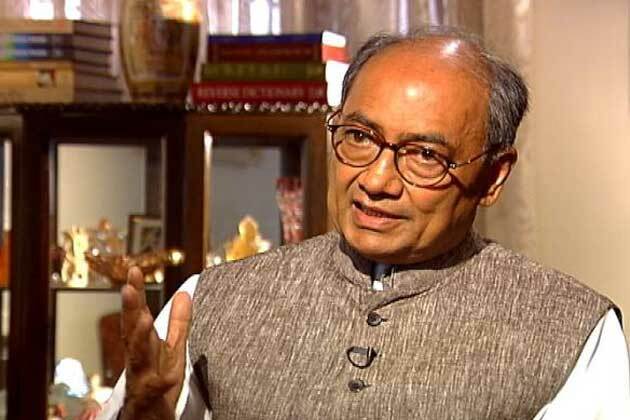 Digvijaya Singh got married again in in August 2015 to Ms Amrita Rai a journalist who has worked in Star News NDTV Zee News and as a Senior Producer in RSTV.